If you are looking for a natural beauty soap to optimally care for your skin, I give my highest recommendation to Dr. Ohhira's Probiotic Soap. What I find distinctive about Dr. Ohhira's soap is that it provides a thorough cleanse, but doesn't leave skin feeling dry. I regularly recommend Dr. Ohhira's soap to people who tend to have oily or dry skin. Does not contain fragrances, stabilizers, deodorants, preservatives, chemicals, synthetic minerals, or artificial colors. Its constitution is such that it lasts far longer than conventional bars of soap. These raw ingredients are carefully blended with 12 strains of lactic acid bacteria, and then allowed to naturally ferment and mature for up to five years before being used for Dr. Ohhira's Probiotic soap. Please store Dr. Ohhira's Probiotic Soap in a dry location. Please keep beyond the reach of infants and young children. Soap pack contains an oxygen absorber to optimally preserve the quality of Dr. Ohhira's Probiotic Soap. Please dicard absorber after opening. How to Save Money on Shipping: If you choose to purchase Dr. Ohhira's Probiotic Soap through our Web site, I recommend that you only do so along with other items that you can make use of. This is because UPS (for orders in the States) and USPS (for orders everywhere else) charge one main fee to ship any package, and then add only modest increments for each additional item. Ordering more than one item at a time will significantly reduce your per-item shipping and handling charge. This principle holds true with any combination of items that you order from our recommended products section. For example, if you order a package of Dr. Ohhira's Professional Grade Probiotic along with this all-natural beauty soap, then you will save significant shipping dollars per item. I love this soap! I have light psoriasis on my forehead and all facewash and soaps irritate it--I would have to use heavy lotion afterwards because of flakiness. I tried 'washing' with oils for a while, and that was okay, but there was an immediate difference the first time I used this. I only use it on my face and it will be the only one I'll ever use again. An update on my 2009 review: The "winter rash" which are red itchy patches of dry skin (previously diagnosed as eczema), have NOT reappeared since I have been using this soap! What relief!! I absolutely love this soap. I used it in the shower and also to wash my face. I don't order it as often because of the price (since I am watching my budget) but for a treat I will order a bar every so often. It does not leave my skin dry or tight and it cleans really well. This soap rocks. It does not leave your skin dry and tight. It also lasts a long time so it is worth the money. For me, it burns a little if I get it in my eyes so just avoid the eye area. I've been using this soap for almost two years. It doesn't dry out my skin, and it smells delicious. As an added (albeit meaningless) plus, the little cardboard box it comes in is the prettiest packaging I have ever seen. 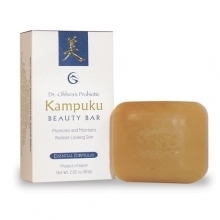 I am thrilled with this probiotic soap! I have had excessively oily skin for approx. 33 years. Normal skin at last! Hopefully, I won't experience the winter rash this upcoming season.